Large landscape projects are hard to visualize, complex to design and price, and challenging to manage. In addition large projects are expensive. As a homeowner, it can be difficult to discern if the landscape professional you’re hiring has all the right qualifications, licensing, insurance, etc. 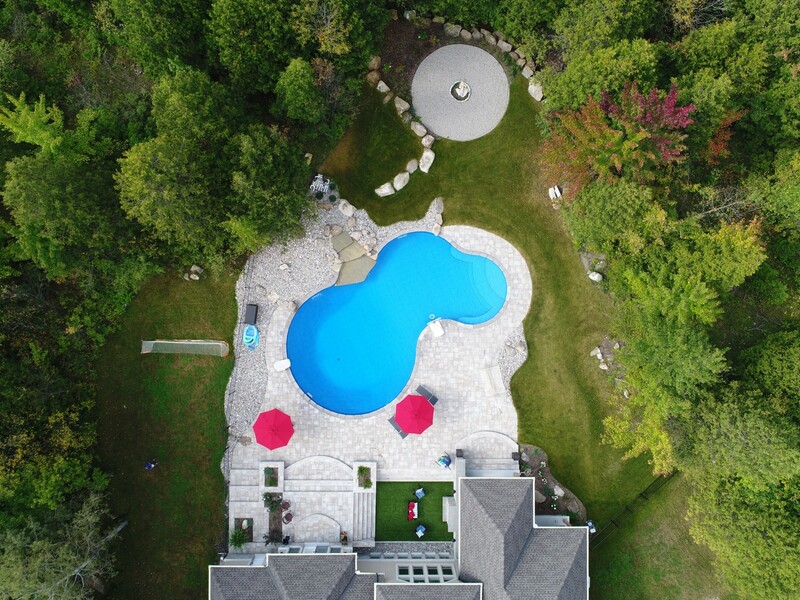 Our large landscape project process is designed to assure our prospective clients that Mallette Landscaping and Pools has the integrity, experience, credibility and reliability you are looking for. We review our process with you at the initial meeting. This project began with a 3-D landscape design (slide 1). 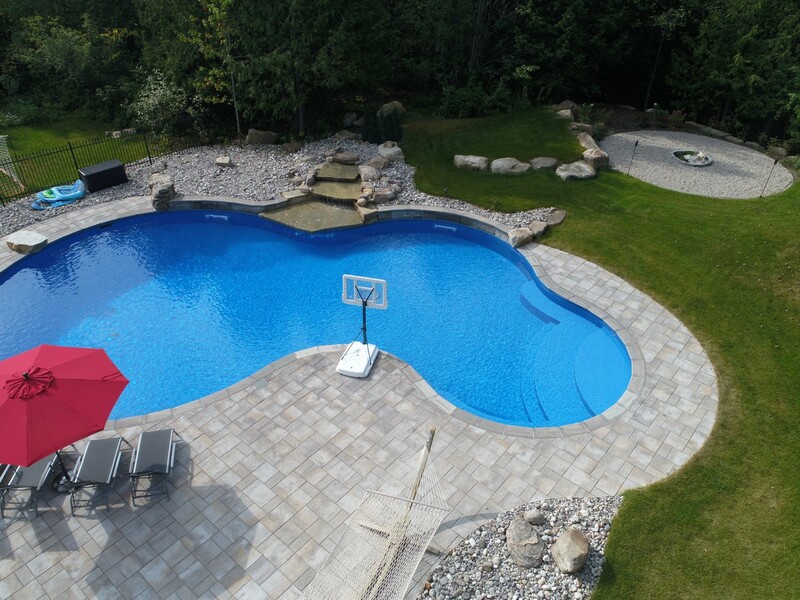 The main feature is a 57 ft swimming pool installation which has a 32 ft diameter deep end. 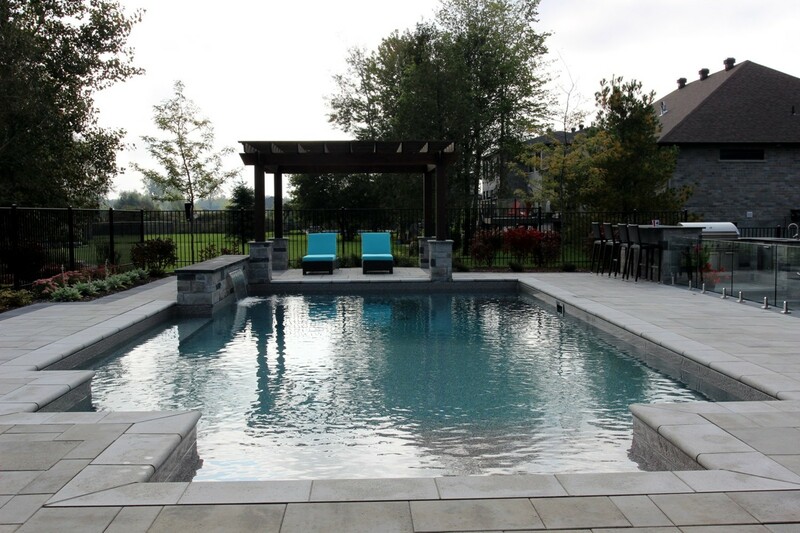 A large natural stone water feature with a sheer descent water feature on either side backdrops the pool. 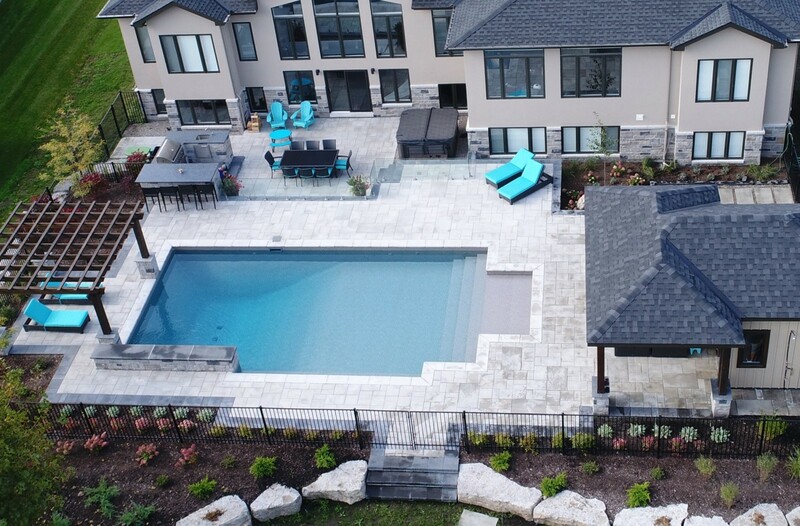 The pool is surrounded by a large interlock patio with steps leading to a change room and living area as well as steps leading to landing (future outdoor kitchen) and polished concrete bar. 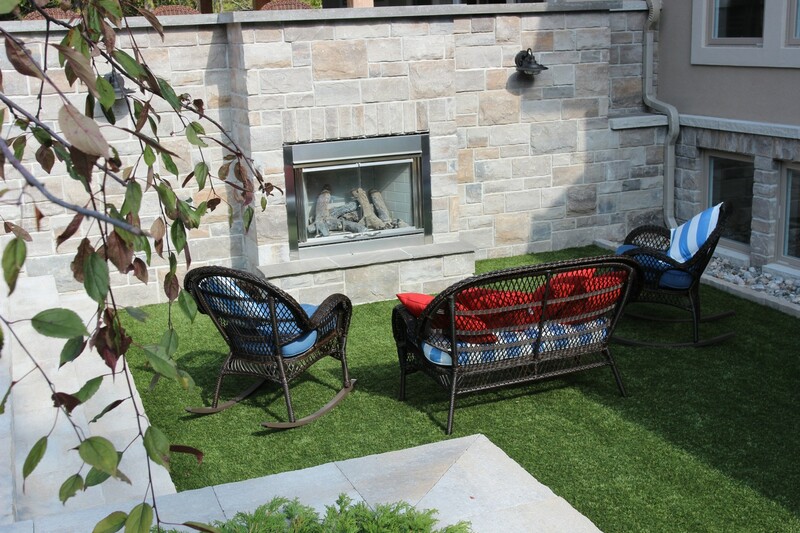 A sunken grotto with a gas fireplace constructed from same brick as house provide a beautiful spot to relax. 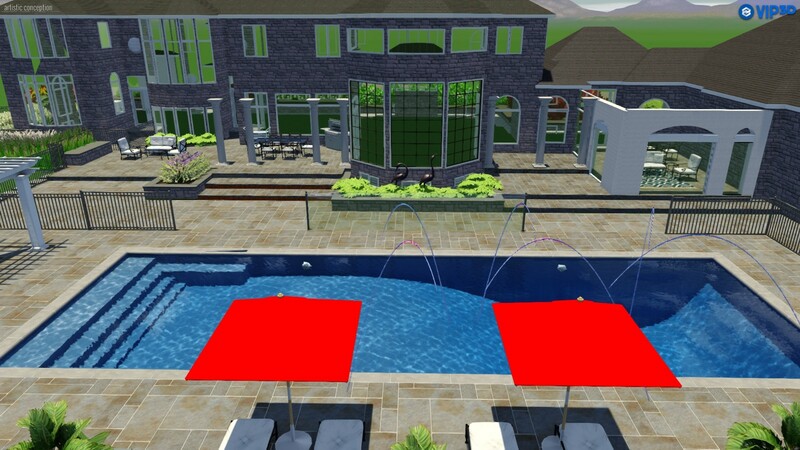 This project began with a 3-D landscape design. 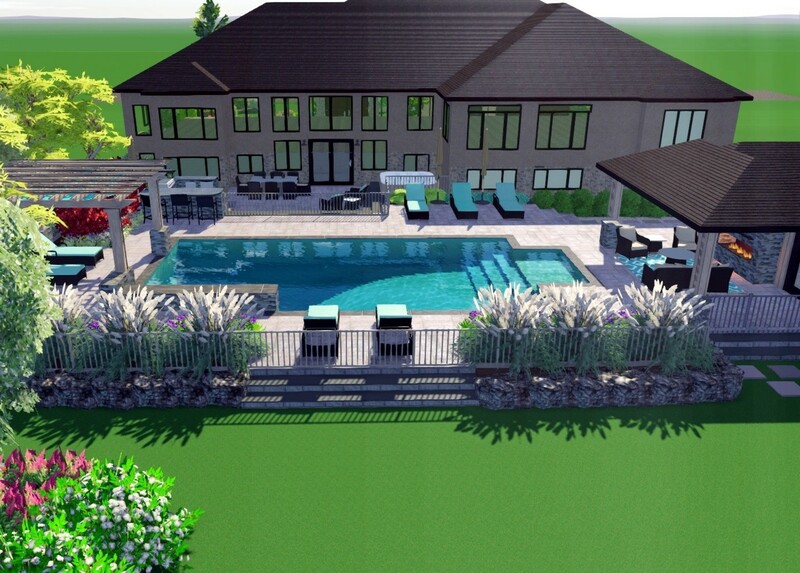 The main feature is a 41 ft custom swimming pool installation with a sheer descent water feature and sun bench. 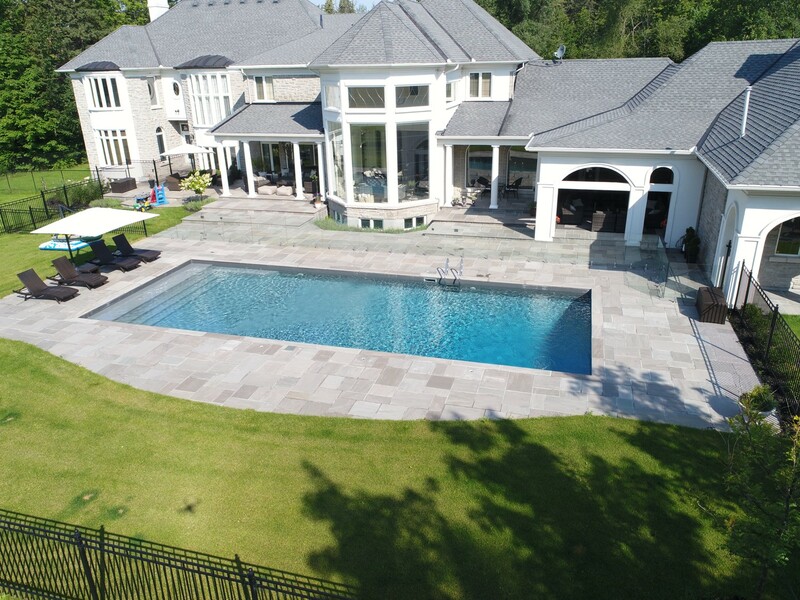 A large patio surrounds the pool. 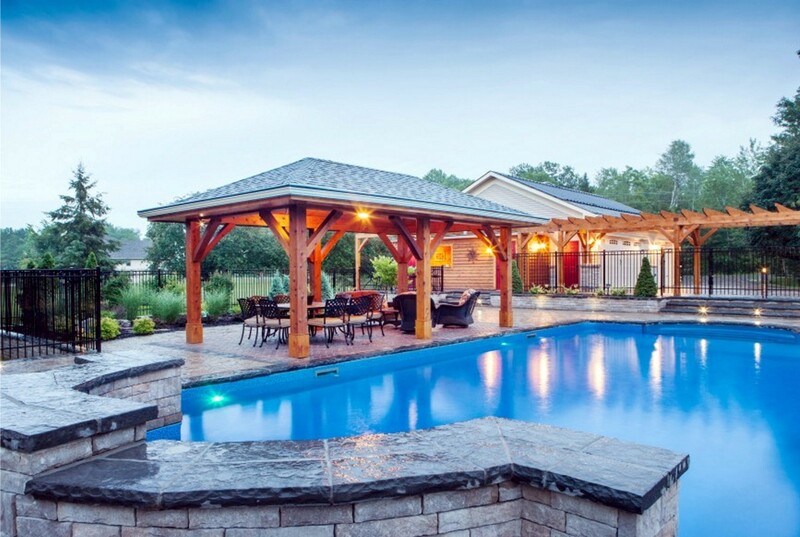 One end of the pool has a pergola and the other end has a retreat with change room and a fireplace in lounge area. There is a large outdoor kitchen, which has a poolside bar, on the lower dining patio. All stonework is done with same stone used on the house. An added safety feature inside the ornamental iron perimeter pool enclosure is a glass fence separating the children's play area from the pool. 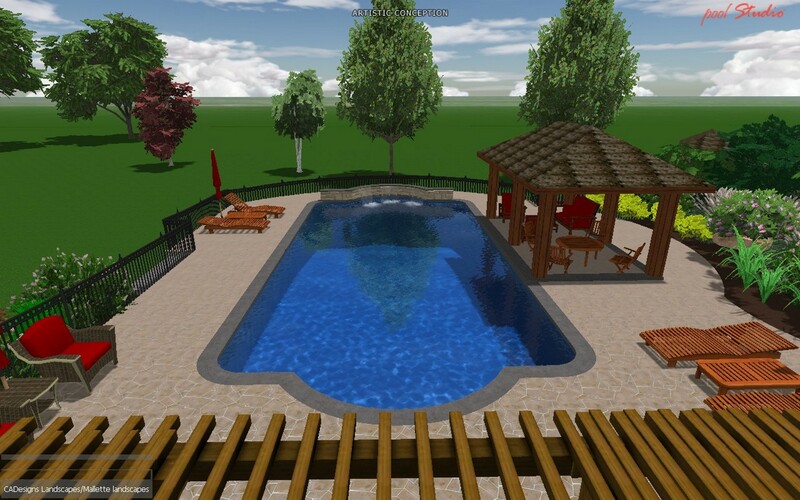 This project began with a 3-D landscape design (slide 6). 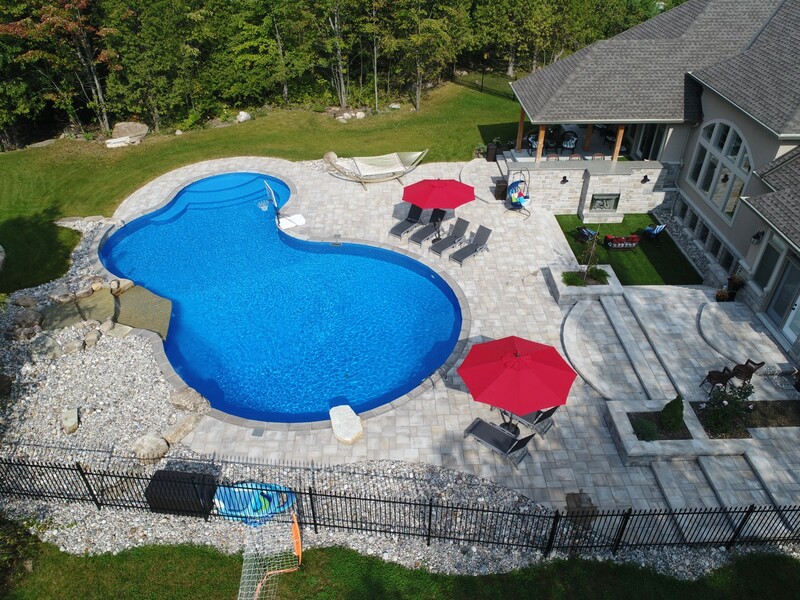 The main feature is a 50 ft x 20 ft pool with benches on either side of the steps. 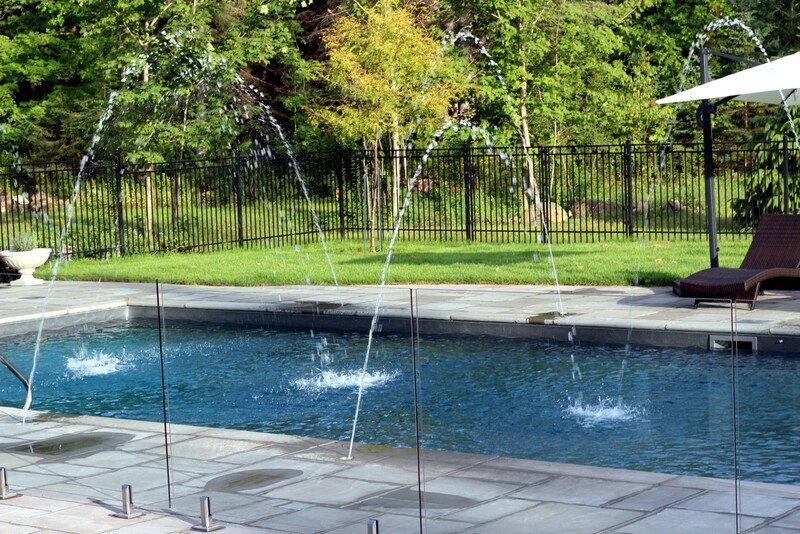 Water jets line both sides of the pool. The patio, steps and sitting areas are finished with natural stone mortared to a cement base. The perimeter enclosure is ornamental iron fence. 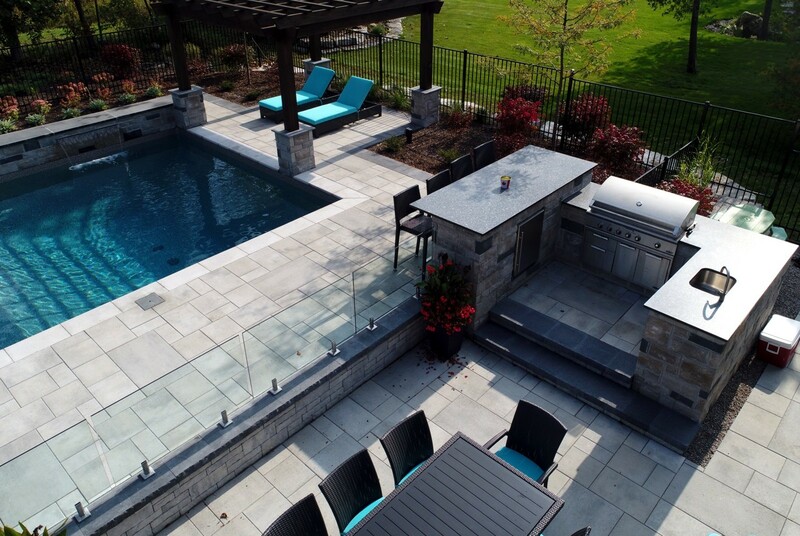 A glass fence runs between the pool and the house as an added security feature for small children. 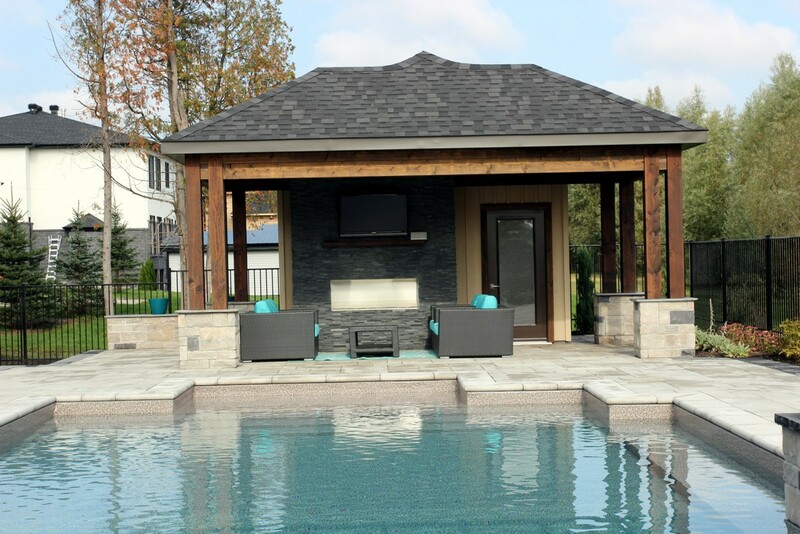 A natural stone fire pit is located just outside the fence. 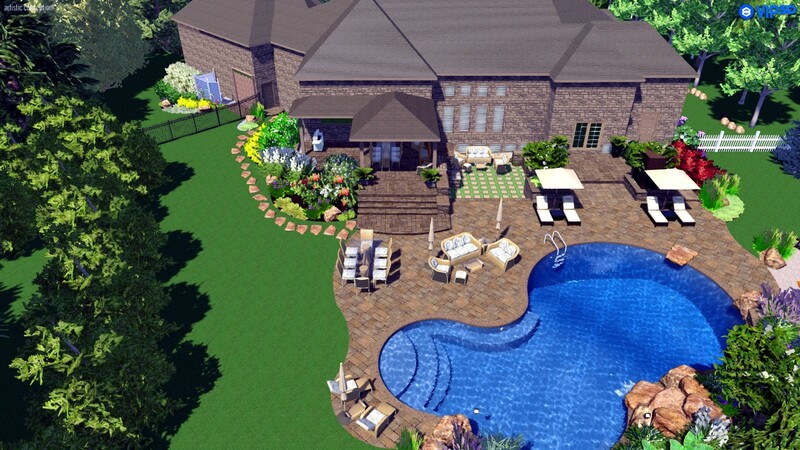 This project began with a 3-D landscape design. 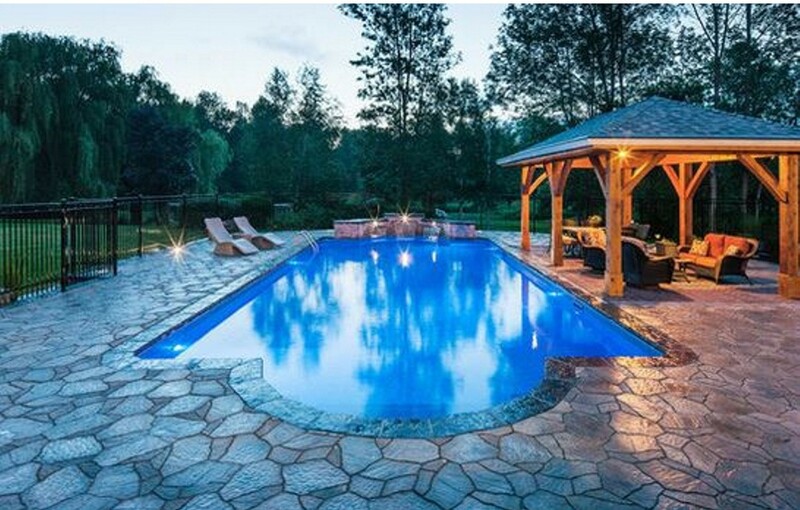 The main feature is a 20 ft x 40 ft pool with a large step at one end and water feature bench at the other. A large patio is surrounded by an ornamental iron fence. 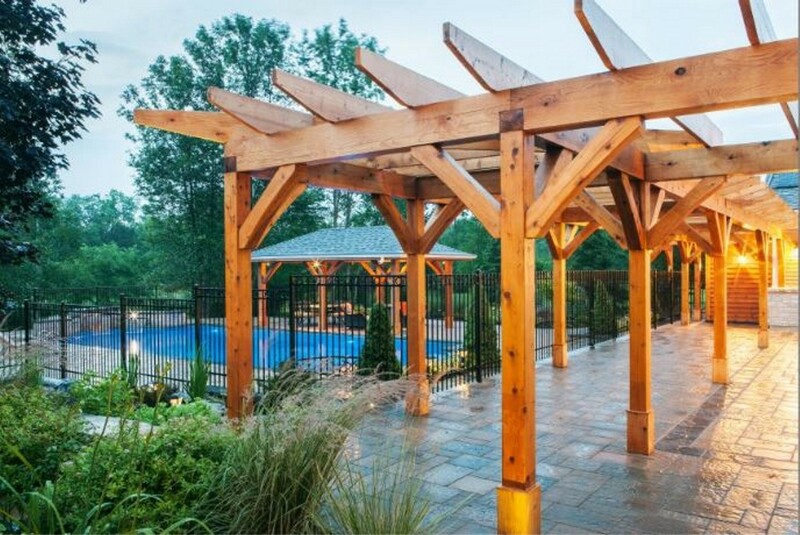 A post and beam poolside retreat is accented by a post and beam pergola running from the new garage / cabana to the house.